OUR BRAND NEW OPTION TOOL HAS ONE PRONG INSTEAD OF TWO. THE BALL OR SPIKE MARKS ON THE GREEN CAN BE FIXED WITH A STABBING MOTION RATHER THAN A SHOVEL MOTION, SO YOU CAN BRING THE RUPTURED MARK BACK BY STABBING QUICKLY ONTO THE GREEN, AND THEN FLATTENING THE GREEN LIGHTLY WITH YOUR PUTTER HEAD. THIS BRINGS MORE OXYGEN TO THE ROOTS AND LESS DAMAGE TO THE SURFACE. 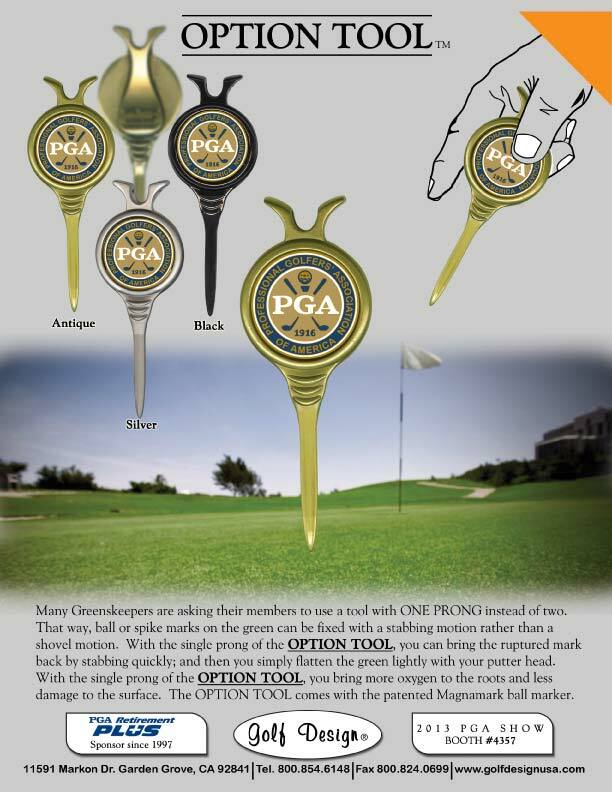 LIKE ALL OUR TOOLS AND PRODUCTS, THE OPTION TOOL COMES WITH THE PATENTED MAGNAMARK BALL MARKER.